The Scrambler Icon is the starting point from which to express yourself. It is characterised by its comfortable riding position and steel teardrop tank with interchangeable aluminium side panels. The 790 mm seat height ensures comfort for both the rider and passenger. Stand-out features include the wide handlebar, the headlight with glass lens and LED guide-light, and the Dual Sport wheels. An aluminium finish for the belt covers, the heat guard and the interchangeable surround of the characteristic LCD instrument panel all enrich the style of the bike. Front wheel: 10-spoke in light alloy, 3.00" x 18"
Rear wheel: 10-spoke in light alloy, 5.50" x 17"
The power/torque values indicated are measured using an engine dynamometer according to homologation regulation and they correspond to the homologated data, as quoted in the Bike Registration Document. Kerb weights indicate total bike weight with all operating consumable liquids and a fuel tank filled to 90% of capacity (as per EC standard 93/93). ** Only for countries where Euro 4 standard applies. Valid from April 1, 2019 to June 30, 2019. See dealer for details. All motorcycles must be warranty activated within 24 hours of the sale or by midnight on the final day of the respective promotion, whichever is sooner, to be considered eligible for Ducati Apparel and Accessories Offer. 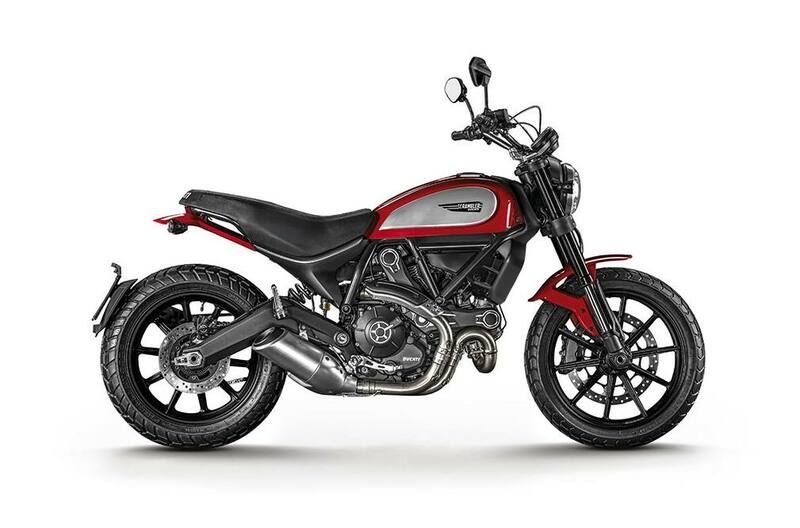 All eligible motorcycle sales must be bona–fide retail sales, delivered according to the Ducati Retail Sales Policy, and properly warranty activated. Warranty activations to employee staff will need to be verified. Offer applies only to new, not previously warranty activated models; demonstrator models invoiced without additional incentive are eligible. Offer applies only to select 2018 models invoiced at Standard Dealer Net pricing. Units invoiced with a discount from Standard Dealer Net are not eligible for Ducati Apparel and Accessories Offer. Any suspicious activity will be audited and transactions in question will be required to provide proof of sale. Abuse of the programs will void all Dealer incentives and or bonuses. This bulletin and the details included herein are not for distribution to the public, outside the Dealership, or other OEM. Violation of this condition will automatically disqualify the Dealer from any benefits associated with participation. Eligible units, once voucher has been submitted, will receive a credit to their Ducati Parts Account the month following voucher submission. Dealers receive 100% of the Voucher value with an order of apparel and accessories for your showroom or current customer at 100% of the offer value. Vouchers submitted without matching order will receive 50% of the offer value as a parts account credit. Request for new Ducati Apparel and Accessories Order should be submitted on the Request Form attached to this bulletin. Units sold without the corresponding Voucher Form submitted will not receive credit. All sold units require voucher submission for reimbursement. All Ducati Apparel and Accessories Orders must be placed by DNA on behalf of the Dealer in order to qualify for the Parts Account Credit. Orders placed by the Dealer via DCS will not qualify and will not receive Parts Account Credit. Parts Account Credit will not be applied retroactively to existing or previously processed DCS Orders. Please see attached Apparel and Accessories Offer Voucher for further details. All motorcycles must be warranty activated within 24 hours of the sale or by midnight on the final day of the respective promotion, whichever is sooner, to be considered eligible. Financing approvals and rate commitments are good for 30 days from approval date. 0% – 25% down payment requirement based on credit tier and credit worthiness. The minimum amount financed is $5,000. Eligible purchases must be made, contracted and warranty registered between 4/1/2019 to 6/31/2019. Motorcycles must be sold new untitled and not previously warranty activated (demonstrators are eligible). Motorcycle must be sold and reported during the program period. See your DFS National Program Binder for details regarding advance amounts, dealer reserve rates, and other DFS program Rules & Regulations and Terms & Conditions. Monthly payments will vary depending on down payment and approved credit tier. Program details are subject to change at any time. $100 credit upon warranty activation of valid retail sale. Additional $200 credit may be earned for each eligible 2018 model retailed during the Program Period upon achievement of 90% Q2 Retail Bonus Target (retroactive to 4/1/19). Additional $300 credit may be earned for each eligible 2018 model retailed during the Program Period upon achievement of 100% Q2 Retail Bonus Target (retroactive to 4/1/19). Warranty activated units must be paid off Dealer’s Wholesale Credit Line within 15 days to be eligible for Sales Incentive Credit(s). Credits will be paid after Q2 quarter close the final week of July. Program details are subject to change at any time. 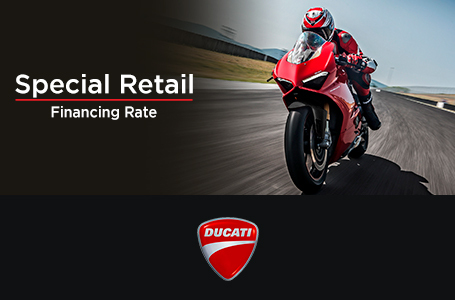 For questions regarding this promotion or Ducati Financial Services, please contact your Regional Business Manager. Please see dealer for a copy of the needed Voucher Form.